The versatility and resiliency make them a productive choice for cattle in an uncertain future. Help get the word out to commercial breeders and dairy farmers, large and small…efficiency and components matter more than ever, and hardiness and pluck actually do matter. The industry needs diversity and choice. Ayrshires excel as grazers and make a great fit for any herd. The breed that has not lost its characteristics or its heritage but still has an important place in the modern dairy industry. I would like to see Ayrshires be a breed that maximizes milk production, without sacrificing the grazing, thrivability, components and longevity traits that they are known for. Keep pushing the breed to reach its potential in production, fat, and protein and conformation. We are not far behind but must push. Increase quality marketing! Intelligently market the breed as ideal for niche and grazing systems. Ayrshire breed should be sought after for milk production and components—numbers should grow to compete with other breeds OUTSIDE the show ring. The breed should be growing, not declining. If we don’t reverse our trend, we may be non-existent. Promotion is very important. Promote the breed’s economic assets. I have grown up with Ayrshires and they are part of my family’s history. I want to be able to pass along my experiences to my family and children. Ayrshires need to stay functional and valid in today’s dairy market. To make owning Ayrshires an accessible, desirable, and profitable experience. 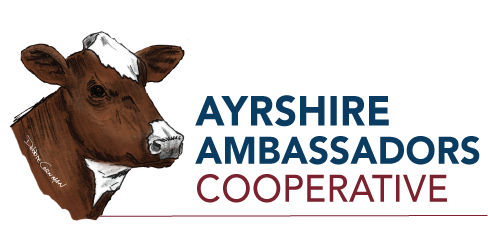 To bring together individuals, families, farmers, and others who share a passion for Ayrshires and will work collaboratively to ensure the future of the breed. The U.S. Ayrshire 2016-17 Yearbook is Here!